James Milner is one of the most reliable footballers walking the face of the earth at this moment in time, but at 33 years of age he is very much in the twilight of his career. It would make sense, then, for Liverpool to begin making succession plans for their most dependable player. 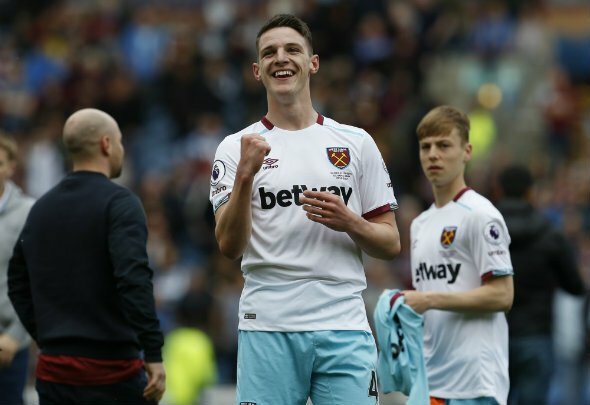 It appears that that is what they are trying to do with their reported pursuit of West Ham United midfielder Declan Rice. The Daily Express reported on Saturday that Tottenham Hotspur were plotting a £35million bid for the 20-year-old, but that the Reds are also targeting the Hammers star. Rice would be an unbelievable signing for Liverpool. He is exactly what they need moving forward: a young, English player who can provide cover in multiple positions. He might not be quite as versatile as Milner yet, but he can play at centre back as well as in central midfield, something that would come in handy right about now for the Reds. Most of all, though, he would provide the professionalism and the hard-working nature of Milner. Already in his young career he appears to be someone who leads by example, barking orders at more experienced players and producing performances that belie his tender years. Imagine the player he’s going to be in five years time, and then imagine pairing him with Fabinho and a hopefully much more dynamic Naby Keita in central midfield. It might not be Keita, but the thought of pairing the developing Rice with the type of world class players plying their trade at Anfield is mouth-watering. This isn’t someone that you want ending up at Spurs, or any of Liverpool’s other top four rivals. This is a player who could conceivably spend a decade plus of Merseyside – that’s absolutely invaluable. Milner is a one-of-a-kind type of player, but Rice might be as close as you can get to him in terms of quality, versatility and character. With the former England international winding down, it might be time for Jurgen Klopp to ensure he has his successor in place by signing the 20-year-old.